Trust Accounts are held and managed by several industries for the purpose of holding over funds for a third party. For example, a bank or trust company (acting as an authorized custodian) will hold funds for a specific purpose such as to pay property taxes and/or insurance premiums associated with a mortgaged property. It may also be a savings account established under a trust agreement whereby a trustee administers the funds for the benefit of one or more beneficiaries, as in a self managed super fund. Real Estate Agents, Conveyancers, Lawyers and Solicitors will most likely be authorised custodians of Trust Accounts. As authorised custodians, it is a legal requirement for all trust accounts to be audited by a registered external examiner. There are several steps in this process which are strict and enforced. Trust Accounts come with a great deal of responsibility and – as the name suggests – trust. For this reason, they are highly regulated. What do you need to do as an authorised custodian of a trust account? Trust accounts must be audited every year and the auditing year is dependant on which state in Australia you are practicing. In New South Wales, the auditing cycle is from April to March of the following year with all audits being completed and submitted by 31 May of that year. In South Australia the auditing cycle follows the regular taxation period of July to June. The Law Society regulations stipulate all trust accounts must be audited within the set time frame with certain processes followed by both the legal firm and their appointed external examiner. It is recommended you familiarise yourself with your local jurisdiction to ensure you are abiding by the correct rules. As authorised external examiners, we are governed by The Law Society of New South Wales. 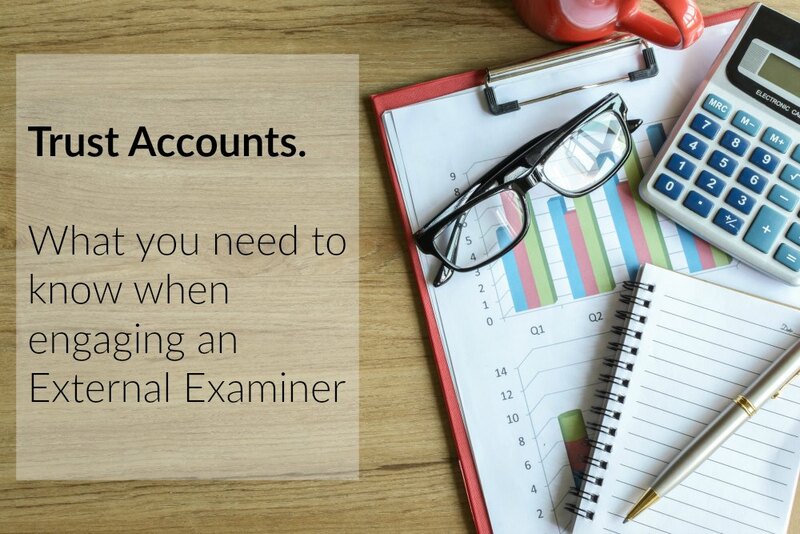 When looking to engage an external examiner, you MUST engage only a person who is registered to carry out the audit. Legal Practitioners must only engage a person who is granted designated person status by The Law Society. The appointment must be agreed to in writing. A law practice should appoint a designated person as external examiner, allowing sufficient time in order to comply with the requirements set by their state and must provide written notification of the appointment to the Law Society. This must be done within two months of the appointment of the designated person as an external examiner. Again, refer to your state laws as appointment processes can differ. Engaging Canale Tax and Accounting as your external examiner. As a registered New South Wales External Examiner by The Law Society, we are authorised to act as your business’s external examiner. Nicole Canale can walk you through the process and ensure your trust accounts are in line with all legal requirements. Please contact Nicole for a confidential discussion.